I am always looking for useful products that will make my life easier in the shop. Products like the HSPC Techstation, external Hard Drive units, the never hot soldering gun, and Power Supply Testing units. 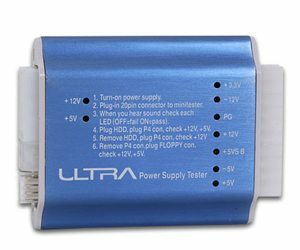 Power Supply testing units are as important as a screwdriver if you like to save time trying to figure out if a power supply works or is failing. 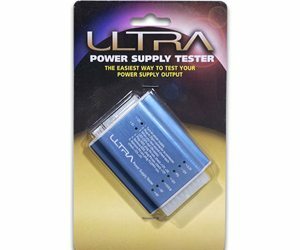 Enter the Ultra Power Supply Tester. There are many Power Supply Testers out there, some are as simple as a 20 pin female connection and an LED that lets you know if there is some juice or not. This unit is a little different. First of all, it tests all the voltages and sounds audibly and visually that the power supply unit is working or not. The front of the unit displays basic instructions, along with your visual aids. 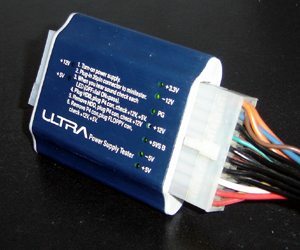 This snazzy looking test unit also shows you the +3.3V, -12V, PG, +12V, +5VS B, -5V, +5V on your 20 pin connection and +12V and +5V on the 4 pin power connections that gives the rest of your PC life. The unit is extremely easy to use, and should you forget; there are instructions on the box, and also on the unit itself. Simply plug your power supply in, then connect the 20 pin connection to the Power Supply Tester and you are done. If all your lights are lit and you hear a friendly little beep, your power supply is operable. If not, invest in a new one. While you are at it, you can check to see if your floppy power connection is working, along with your 4 pin Molex. This is useful if you sleeve your own PSU’s and want to test it before putting it into a working system. The display is simple, clear, and to the point. The tester is small, no bigger than a cell phone, and it will fit in any geeks “Bag-O-Tech” easily. No artificial filler here… and with the price at $15.00, how can you go wrong? This is something that everyone that sleeves a PSU or works on systems should have. This unit is simple, and so is the review! Have fun!